If you want your loved ones to be safe in a shower environment, it is important to install some safe shower stalls for their well-being. Homeowners are deciding to have their bathrooms remodeled to comfortably and safely accommodate a loved one who may be in a wheelchair or have mobility issues due to age, an injury or a physical handicap. When this is the case, it is necessary to have an accessible open shower unit available for their personal hygiene needs. By using the guidelines for installing safe shower stalls, within the home, that are set up by the Americans with Disabilities Act, you are helping to preserve some of your loved one’s sense of independence, while providing them a safe showering environment for tending to their personal hygiene needs. 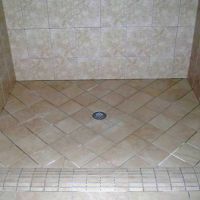 A shower seat that is located on the opposite side of the facet and water controls in a 36 inch x 36 inch shower stall. When installed in a 30 inch x 60 inch tub style shower unit a fixed seat can be located on the wall that is opposite of the controls or you can install a folding style seat on the same wall as the controls are located. A grab bar should be installed on the back wall of the tub where it is within easy reach of the individual when sitting down. A shower head that is attached to a hose that is 60 inches in length and can be used both in a stationary manner and as a handheld unit provide the best results for handicap shower stalls. A fixed shower head that is positioned 48 inches from the floor of the tub or shower unit is also acceptable as long as it does not require the person to have to reach over their head, creating a slip and fall risk. Safe shower stalls that are 36 inches x 36 inches should have a curb that is no higher than ½ inch high from the bottom of the shower unit. For shower stalls that are 30 inches x 60 inches there should be no curb on the side. There should be no shower enclosures such as doors that will interfere with the transfer from the shower chair to a wheelchair or vice versa. It should be an open shower stall. For the able bodied, enclosures are acceptable to prevent the splashing of water. However, open shower stall units are great for creating the illusion of a larger bathroom. Add a couple of shower mats to reduce the chances of slipping. These are the safest open shower stalls for seniors because they eliminate the curb and anyone with knee or hip problems will find them life changing. Following these guidelines will provide you with a sense of security when you want to give your loved one a safe environment for their grooming needs. This will also help to alleviate some of the stress placed on the person who is trying to help care for the individual by providing a peace of mind in knowing that the loved one has access to all of the necessary safety equipment available.